Watercolor painting… I love it, its fun, its imperfect and so nautical looking. 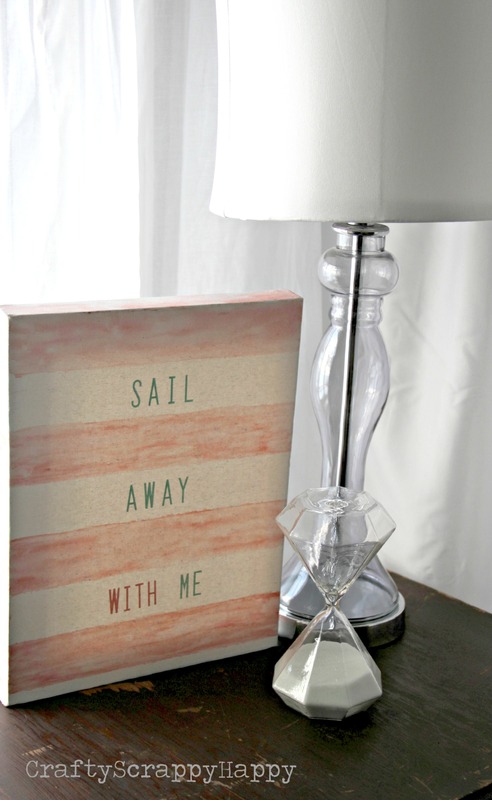 I had such a nice time sitting down and creating this simple DIY nautical watercolor canvas! I think it fits right in with my be achy decor. Now if only that lake in the background of this picture would turn back into water! It is about 1/4 water and 3/4 ice right now, the spring and my lake are slowly coming!! I think my spring and beach-y crafting is true proof that I am SO ready for this summer! It was a simple DIY, but if you are wondering how, here are the details! I measured out my stripes with painters tape and then I used watercolor paint to make the stripes. I then added the quote with letter stickers. What do you think, are you as ready for summer as I am? I am SO excited for warm weather! Maybe knowing it is coming is what helping me get through these final few 30 degree days we have left here in Wisconsin. I am sharing my canvas at a few of my favorite parties, you can check them out here!